On June 7th, CSA hosted the Greenwood Drive Access Concepts Community Presentation. At this community meeting CSA President, Bret Martin presented concepts to address the access concerns along the corridor of Greenwood Drive between Sea Pines Circle and Club Course Drive. Below you will find an excerpt from our June 7th , 2018 meeting in which Bret Martin presents the initial plan recommendation. Click here to view the full Greenwood Drive Access Concepts Community Presentation meeting video from June 7th , 2018. Gallery of Shops becomes CSA’s designated pass office, we believe this location will improve our speed of service. This new location will allow CSA to issue and sell passes at one site out of the roadway, away from the gate. This new location will allow CSA to scale our operations as needed based on volume. Letter “B”- Provides for a new traffic lane to merge vehicles into our existing lanes on two lanes on Greenwood Drive. Letter “C”- Provides for a method for turn-around before last curb cut at gate. Allows Club Course traffic to enter Club Course Drive via the right lane on Greenwood, all other traffic entering Sea Pines would continue down Greenwood Drive in the left lane which reduces “weave” after the gate. In this initial recommendation, a timer pad would be installed at the intersection of Greenwood Drive and Club Course Drive. Once a vehicle activates the pad, a timer begins and provides the gate officer with the amount of delay. The gate officer would then be able to slow and or stop the flow of traffic to allow for turns out of Club Course Drive. We need your feedback on our proposed plan. We will collect feedback on the plan for 2 weeks from June 22 through July 6, 2018. Community comments will be provided to the Sea Pines CSA Gate Configuration Committee, CSA Board of Directors, CSA staff directors and our engineers for review. 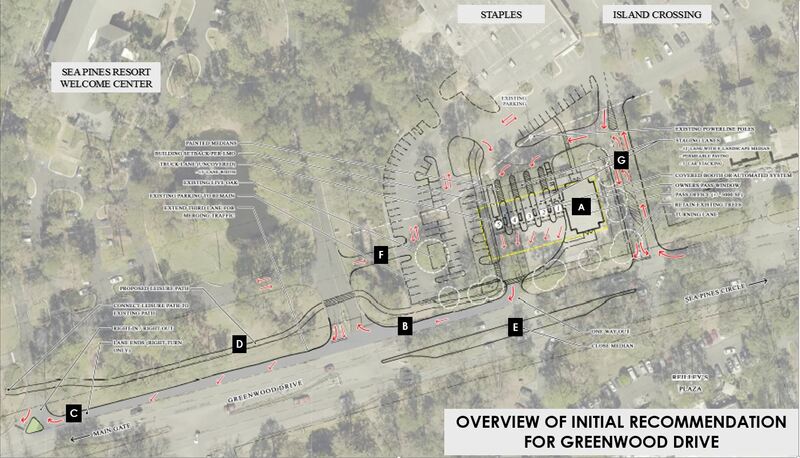 Following the closing of the comment collection period, we will communicate to the community any revisions to the initial plan recommendation for Greenwood Drive Access. We look forward to your feedback related to the initial plan recommendation for Greenwood Drive.